At the disposal of the armed forces of Ethiopia appeared anti-aircraft missile and cannon complexes “Pantsir-S1”. One of the complexes took over duty in the area of ​​the Hidase hydroelectric station under construction on the Blue Nile River. In the same place, the Ethiopian army deployed other Soviet and Russian-made air defense systems. The Russian military equipment was filmed by the Ethiopian television channel ETV. The video is actively sold online. The HPP Hidase (“The Dam of the Great Revival of Ethiopia”) being built, after commissioning, will be the largest structure of its kind on the entire African continent. The construction of a strategically important object was taken under the special control of the Ethiopian authorities and the armed forces. According to experts, the new hydroelectric station on the Blue Nile, which is a tributary of the Nile River, will leave Egypt without half of its water resources. The Ethiopian authorities rejected a number of proposals from Egypt for the termination of the project, because of which relations between the countries sharply deteriorated. 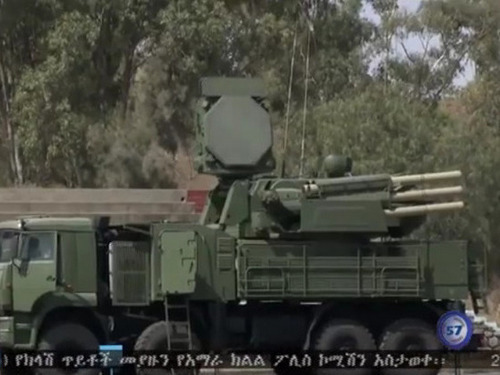 Fearing aggressive hostilities from Egypt, the Ethiopian army decided to strengthen the air defense of the “construction of the century” with the latest Russian weapons. Officially, the fact of supplying these complexes to Ethiopia has never been disclosed. However, a year ago, the New Business Ethiopia reported that the Ethiopian military was showing interest in the Russian Pantsir anti-aircraft systems. One of the reasons for such interest publication called fears Addis Ababa, associated with a possible Egyptian military aggression. The Pantsir-S1 complexes have been in service with the Russian armed forces since 2008. According to the open press, these systems are used by the armed forces of Syria, Iran, the United Arab Emirates, Algeria, Iraq and Oman. The complexes protect the airspace in the region of the Khmeimim base in the Russian Aerospace Forces in Syria and have been successfully used against militant unmanned aerial vehicles several times.